Simple pitching and innovative ventilation for summer camping trips. The SKYROCKET II DOME is a lightweight, free-standing dome tent for two people. Its stand-out feature is the innovative ZIPVENT door ventilation that can be precision-regulated. Combined with the roof vents, it creates a chimney effect which effectively draws fresh air into the tent. 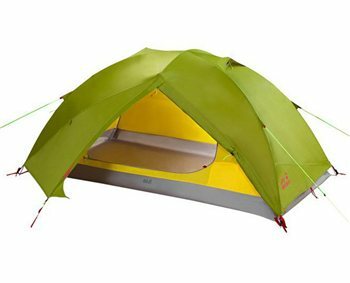 This summer tent is very well suited to trekking. In very warm weather, you can even forget about the flysheet and just pitch the inner tent on its own because it is fully self-supporting. The inner tent has three pockets and a GEAR LOFT to store kit so you can locate it quickly.